Hair loss is seen as excessive process for a man if a person loses hair on a daily basis over than 50-60 items and if it comprise the level of 30 to 50, then hair loss per day is considered normal. 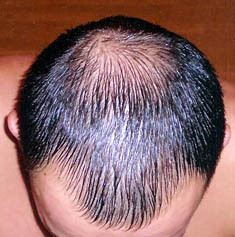 Major causes of hair loss are known as androgenic factor, metabolism disease with deficiency of vitamin B6 and folic acid, as well as agitation, sudden fright and due to stress and general weakening of the body caused by migrated diseases (like anemia, influenza, chronic colds, fever) and less often by a hereditary factor. Most often it is thinning of hair which is partial or complete loss in the crown and around the forehead in males or complete baldness. Castor oil is very beneficial effect on the hair roots. Usage of that stuff is simple i.e. heat the small amount of oil on the water bath and lubricate them to the scalp with an old toothbrush. Then cover the head towel and leave for at least 5 hours and after this procedure the head should be rinsed thoroughly with shampoo containing extracts of herbs. Repeat the procedure for 1 time a week for 1-2 months and not only stop hair fall out but will become of more dense and will grow much faster. A well known and also effective tool for hair growth is the approach when you use rubbing the scalp burdock juice or ointment from burdock root. To do this successfully you are to boil the burdock root first in a quantity of 20 g. of roots for one cup of boiling water. The stuff is to be insisted for a duration of 20 minutes and then boil the liquid again to half the volume. Then you have to add mixed with guttural Heat the lard and pour into the pot. Cover tightly for a while and put the pot in the oven for several hours. With cooled thickened mass drain the water if it is not all evaporated, and lubricate the skin of the head of the ointment. You should mix 10 grams of cognac with 40 g. of strained onion juice and 50 g. of decoction of burdock root (all of these are to be cooked at a ratio of 1:10 where burdock root comprise 10). Apply the mixture to rub into the scalp, bandaged head with a towel, leave a balm for 2 hours then wash your hair. The procedure is done on a daily basis. If you suffer from a strong loss of hair it is better to use for rinsing of broth which is made from 3 tablespoons of chopped calamus rhizome and the welded for 15 minutes in half a liter of vinegar. A very good strengthening hair and preventing hair loss common remedy is nettle. It is the best to use for the treatment the young nettles leaves being cut off before flowering. Prepare a decoction of it, cool to 40 Â° C and rinse their hair after washing. Select Lime blossom and pour 8 tablespoons into half a litter of water to be boiled for about 20 minutes. The obtained broth is to be used when washing head for a month duration. If there is slight improvement, continue to conduct this procedure. It is useful to rub into the scalp birch sap with aloe juice and garlic and add to that honey and chicken yolk. Take all these ingredients and 1 teaspoon, mix well and rub the mixture into the scalp. Campaign was 1-2 hours or more before shampoo. Wash and rinse it suggest a strong infusion of birch leaves. If your hair and scalp diseases useful 2 times a week to wash my hair decoction of burdock root and calendula flowers (20 g and 10 g of burdock calendula to 1 liter of water). You can include in broth 15 g of hop cones. You can make a nourishing hair mask and it id also worth doing. In order to do this properly take one tablespoon of vegetable oil and egg yolks which are stirred and rub the stuff into the scalp every 40 minutes flushing the hair with warm water. This procedure is performed 1 time per week. Use 4 g. of purified propolis placed in a glass bottle, add 100 ml of 40% alcohol, tightly close the cap and shake well. The solution is to rub in the hair roots. Wash the head with warm water but without soap. After that gently massage the scalp and start rubbing common salt. The duration of such manipulation is not more than 10 minutes. Wash hair after that. You are to repeat this procedure 6 times during a week of the treatment. Russian healers claimed that this tool saved many from alopecia with dry scalp.